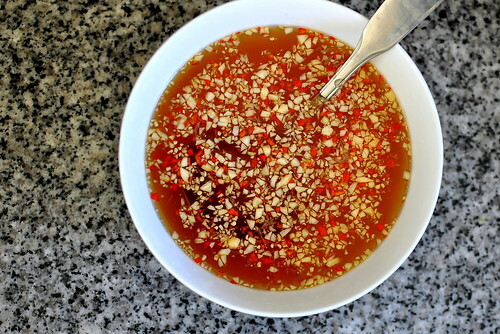 Of all the family recipes I’ve learned over the years, this nuoc cham is without question the most essential. From com tam (broken rice) to banh cuon (pork and mushroom crepes) to cha gio (deep-fried spring rolls) to thit nuong (grilled pork), nearly every dish in the Vietnamese culinary cannon depends on this sweet and sour “mother” sauce to season, spice, and delight. 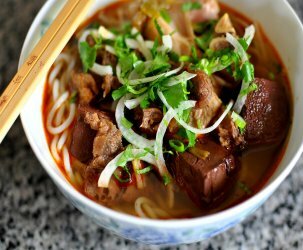 When paired with a lackluster nuoc cham, even the most carefully prepared dishes can fall disappointingly flat. When stored in an airtight container, the vinaigrette will keep in the fridge for up to four months. 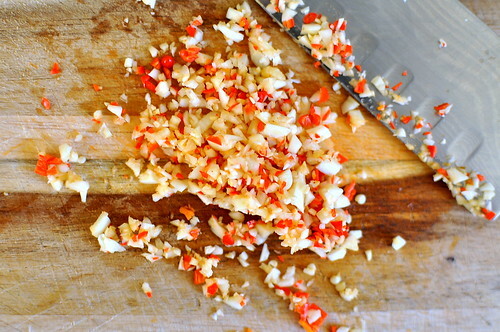 Trim and finely mince garlic cloves and chilies. Set aside. Combine sugar and soda in a medium-sized bowl, stirring briskly with a large spoon to dissolve sugar completely. 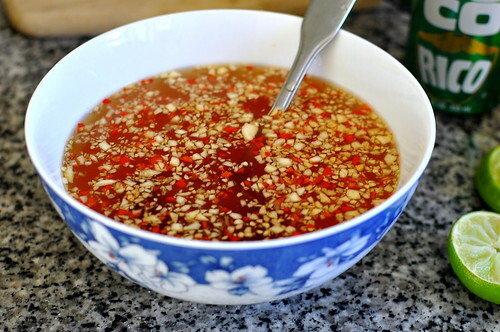 Once the sugar and soda have become one, add in fish sauce, chilies, and garlic and continue to stir until combined. Finally, add freshly squeezed lime juice. Sample the nuoc cham and adjust the seasonings to taste—add more lime juice for sourness, fish sauce for saltiness, and sugar for sweetness. Thanks for sharing this recipe! I’ll have to try it sometime! Ahhh, awesome secret ingredient! Didn’t even know there is a coconut soda out there 🙂 I kinda want to try with 7Up for a citrus kick! I go into nuoc cham withdrawal when I go too long without any. My recent obsession is dousing roasted brussel sprouts with it! Nina! “Brussels sprouts and nuoc cham, sitting in a tree…” A killer combo. You always have the coolest tidbits gastro girl! 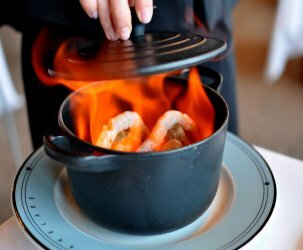 Would you use premium fish sauce for this recipe, or just the regular cheaper kind? Maxine – I would suggest the cheaper kind (i.e. Flying Lion Brand). It’s what my aunt uses and it achieves the flavor that I want. Enjoy! Love nuoc cham!!! Hope I can find that soda. 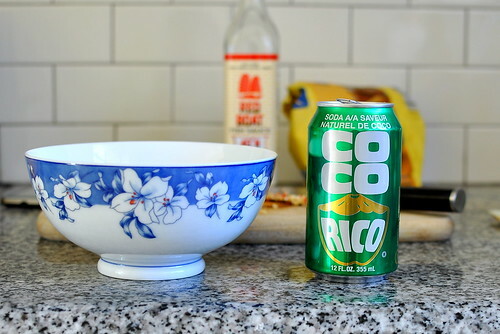 Where do you buy coco rico soda??? Heather – A well-stocked Asian (Chinese/Vietnamese) grocery store ought to carry it. Coconut water works well too. I’m Dawn Po Quimque from GMA Network, Inc, a TV Station in the Philippines. We’re currently working on a short segment about anchovy products, and one of which is the NUOC MAM of Vietnam. 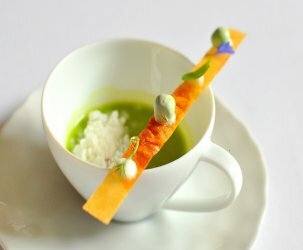 In line with this, we would like to ask for your permission to use these photos of Nuoc Mam posted in your blog. Rest assured proper credit will be given.